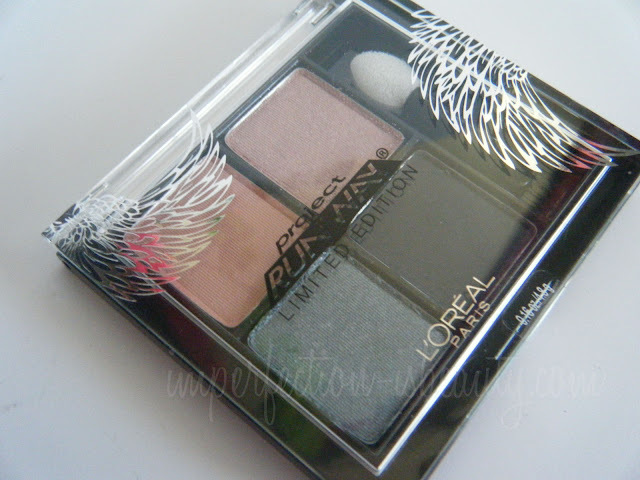 L'Oreal has teamed up with Project Runway and came out with a few limited edition products. From nail polish, to blush, to eyeshadows, I believe they're about 4 or so different collections coming out this fall all of which has a very unique Project Runway theme. I happened to spot this stunning Charming Cockatoo's Gaze quad while I was out and about today. I literally can't find anything about this quad online yet, which is totally irritating. 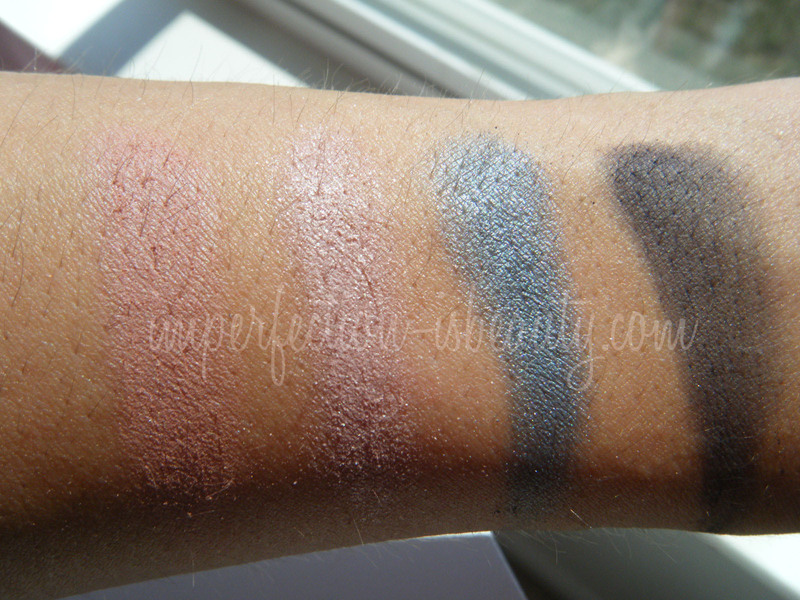 However, I did get a chance to swatch this quad and so far ALL four colors are very pigmented. The two pinks are super smooth and silky, The one to the left I would say is more of a salmon color with a bit of sheen to it. The salmon color would be a great highlight under your brow bone while the pink to right is more on the lighter side and is a tad bit more frosty, both of which are absolutely amazing. The frosty pink would be a gorgeous inner corner color. While the other two blues are a little on the grainy side, the blue to the left is a very frosty/shimmery ice blue, and the navy blue almost pulls grey, you'd never really notice that it was a navy blue. The navy blue shade would be a great crease color. As far as the packaging goes it seems to me that the casing is pretty durable, and thick which is great to carry in your makeup bag, or to travel with. I love the fact that they put wings on the front of the package, makes it look very girly, and pretty. Overall for the most part they are definitely worth the price. I picked mine up at Mejier for about $8. I have never heard of these and thought the colors were just so amazingly gorgeous together. 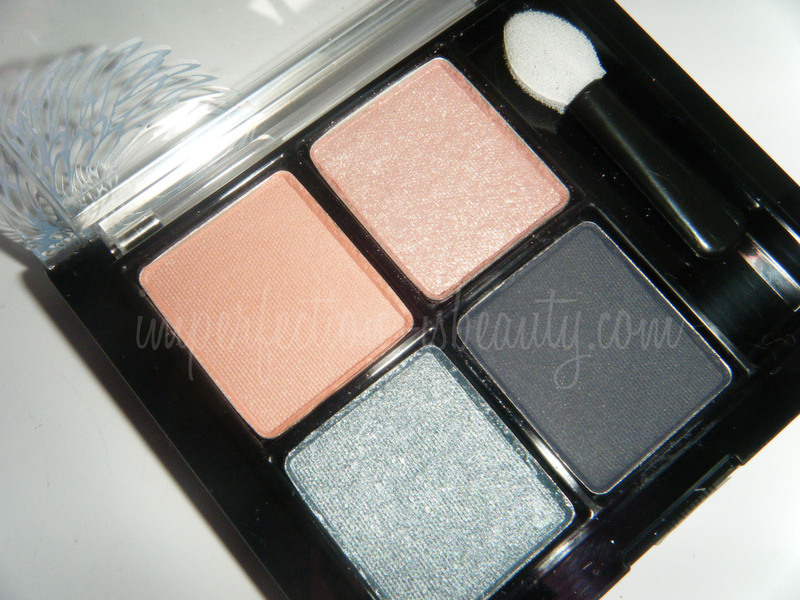 I can't wait to play around with this, I'm sure I'll be doing a FOTD, and review very shortly. Hope your enjoying your weekend! Pigmentation looks good... and I like the mix of colors. Thanks for sharing! Great swatches. I like the look of this palette. I really like these colors together too!! Super gorgeous - thanks for sharing! Isn't it just awful when you can't find info about a new collection online? xD I stumbled across this collection today at my Walgreens and I don't think there's a single thing I wouldn't try; everything is gorgeous! Hello, I check your new stuff daily. Your writing style is awesome, keep it up!